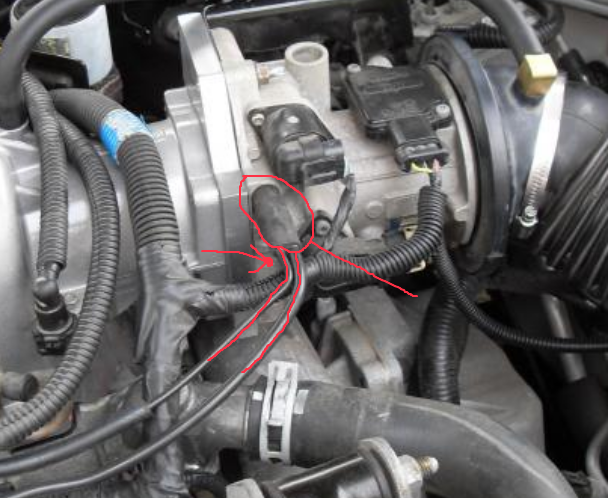 Would anyone happen to know the oem number for the rubber fitting the attaches the evap and fuel pressure regulator lines to the throttle body for a 1999 Bonneville vin K? The two lines fit into one end of the rubber fitting and the other end attaches to the throttle body for vacuum. Mine is split on the evap side so I'm throwing a p0420 code. Any Dorman or Help! equivalent would be great as well. Perhaps a bone yard search? You can replace those with generic vacuum line from any auto parts store. I'll probably try a wrecking yard to find one in good condition. Should be the same on the Bonneville, LeSabre and Olds 88. Otherwise, I may need to get creative with some generic hose and a Dorman hard plastic three way tee. I've got it sealed up pretty good right now with some gasket RTV, electrical tape and a couple of zip ties. Time will tell. There is a "T" on my 3.8 2 series Regal(96) that has a large(3/ side that goes on the TB and a 1/4 " plastic line goes in one end and the FPR plugs in the other side which is even smaller and this vacuum "T" is less than $4. at the dealer. I had the part # but can't find it right now. I found one at the jy the other day, they didn't even charge me for it. Otherwise you could try to piece together a Tee from the parts house. if you go to the dealer and look at the screen the part comes with the tubes that either go to the fpr or evap purge. i wouldnt put a junk yard one it would be as hard and cracked as yours. the dealer one even with having to order the lines isnt that expensive or do what danthurs said. Thanks for all of the suggestions. If anyone can come up with the OEM number, that would be great I'll just order one from GMPD and avoid the hassles. A few of us have also tried using soft tubing, like washer line. It'* a little trickier and will require several weird T-adapters, but our guess is that it'* less prone to cracking as it ages like the typical hard line does. You're free to try any method. From the sound of things, anything will be an improvement. Ive sealed up the existing fitting using rtv sealant, electrical tape and zip ties. Seems tighter than a rats ***. Let'* see if it'* all good for now, the p0440 shall tell all if it comes back. Of course, could be a purge solenoid that is going bad but when I saw the split for the evap hose fitting I'm assuming that is where my code is coming from.